HP has unveiled its CES 2015 display lineup a few days ahead of the show, and in addition to its unique Zvr Virtual Reality Display the company is bringing a range of curved, 4K and 5K displays. These include two 4K displays, the HP Z27s and HP Z24s, and the 5K HP Z27q, plus the curved HP Z34c, HP ENVY 34c, HP EliteDisplay S270c, and HP Pavilion 27c. The company is taking a productivity angle on its ultra HD monitors, noting that their ultra hi-def screens can connect to multiple devices at once and quadruple the real estate of standard HP displays. The HP Z27s has a 27-inch screen and the Z24s measures 23.8 inches, while both displays enjoy 16:9 UHD panels, DisplayPort, CVI, HDMI, Mini-DP, MHL, and USB 3.0 connections, and four-way stands that can pivot to switch between landscape and portrait orientations. They're expected to launch worldwide in January (the Z27s) and April (the Z24s) at $749 (about £490, AU$930) and $549 (about £360, AU$680), respectively. 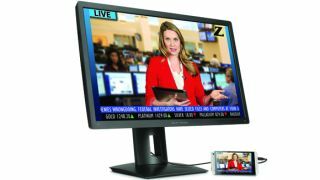 Meanwhile the HP Z27q boasts a 27-inch 5120 x 2880 5K screen with picture-in-picture and picture-by-picture features that let you display real-time feeds from mobile gadgets and other PCs. It will launch in March for $1,299 (about £850, AU$1,600). The four curved displays HP is bringing to CES, on the other hand, have 178-degree viewing angles, 3000:1 CR, and something called "low-haze enhancement technology" that allegedly reduces reflectiveness while maintaining clarity. The HP Z34c and HP ENVY 34c 3000r Curved Displays measure in at 34 inches with a wide 21:9 aspect ratio and resolutions of 3440 x 1440. They also boast the same picture-in-picture and picture-by-picture features as the 5K display and are scheduled to hit shelves in April for $999 (about £650, AU$1,240). Finally the HP EliteDisplay S270c and HP Pavilion 27c 4000r are 27-inch 1080p displays with 16:9 aspect ratio that are available now for $399 (about £260, AU$500).